The images of flooded neighborhoods and lost homes in Texas have been distressing, but with every story about loss there has been one about neighbors helping other neighbors. Many of these heroic acts have been performed by IAM members. IAM Transportation members have been omnipresent in their communities since the storm hit and Brother Jorge Revuelta, a United Customer Service Agent at IAH of local 2198, is one example. Last Monday, Jorge received a call from his son-in-law alerting him that nearby neighborhoods were in dire need of help. Even though they had no rescue experience, Jorge and his son-in-law took their boat to the flooded streets and started their rescue search. Throughout the day, Jorge and his son-in-law saved over 20 families, including an elderly couple. 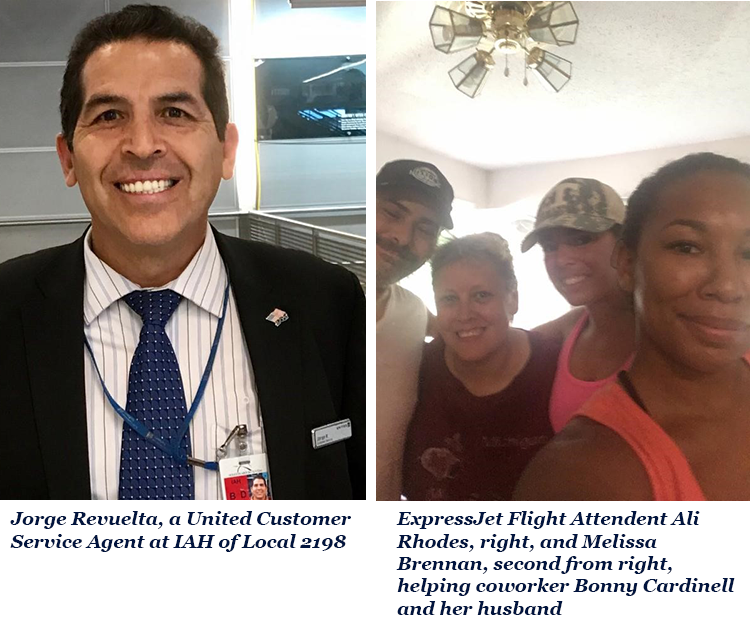 IAM ExpressJet Flight Attendant Representatives Melissa Brennan, Ali Rhodes and Sara Gonzales have all flown to Houston on their own time to aid and assist displaced families, including a fellow flight attendant who lost everything. Employee Assistance Program (EAP) Chairs from Districts 19, 141 and 142 and Transportation Grand Lodge Representative (GLR) Sandy Gardner have been coordinating activities with EAP reps on the ground who have been meeting with members in the aftermath of the storm. They are providing humanitarian resources, including IAM Disaster Relief Application Forms, along with directing members to federal, local and community resources. The Transportation District Lodges are ensuring that all members in the Houston area have EAP representatives and can contact them at any time. IAM members who have suffered a loss, please contact your local lodge representatives for more information regarding the IAM’s disaster relief program. Click here for more information on the IAM’s disaster relief program and to donate to aid IAM sisters and brothers in need.